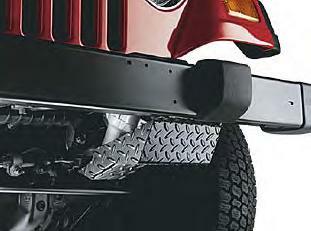 Skid Plates for the Jeep Wrangler provide added protection when traveling off road. Made from heavy-gauge steel and painted with a high quality black powdercoat finish. - Tomb Raider Edition Silver Diamond Plate Front-End Applique. Mounts to OEM front bumper. 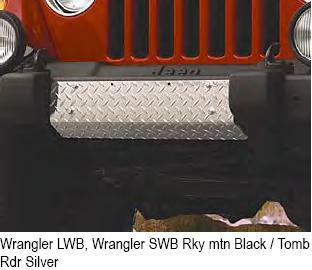 - Rocky Mountain Edition Black Diamond Plate Front-End Applique. Mounts to OEM front bumper. 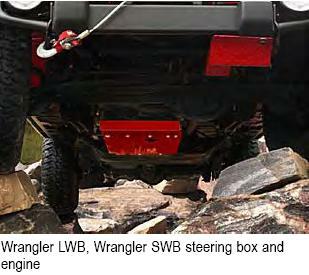 - Steering Gear, Heavy steel tread plate protects the steering gear box. - Oil and Transmission pans, 6 Cyl, Part will NOT fit a Rubicon model that is at stock ride height due to drive shaft rubbing .